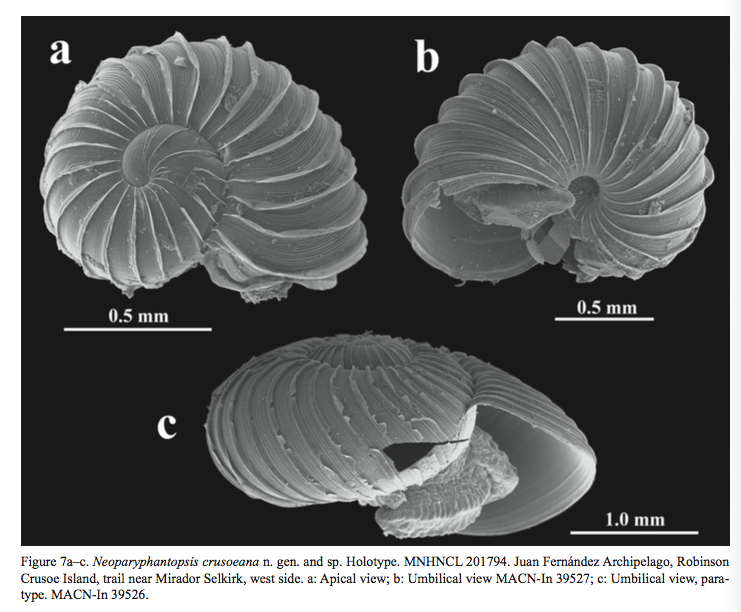 Miquel & Araya (2015) recently published on new shells from the Juan Fernández Archipelago off the coast of Chile. This is the first addition since nearly a century ago. One species is new described, Neoparyphantoplsis crusoeana gen.n., sp.n. ; one replacement name is introduced (Tornatellina juanfernandeziana), and five species are re-described. Miquel, S.E. & Araya, J.F., 2015. New records of terrestrial mollusks of the Juan Fernández Archipelago (Chile), with the description of a new genus and species of Charopidae. Archie für Molluskenkunde 144: 155-167. This entry was posted in Uncategorized and tagged Achatinellidae, charopidae, chile, literature, types, vertiginidae on March 22, 2016 by bramb.